Andy Thomas creates “audio life forms” from bird sounds. The result: Nightingale & Canary, a bird sound animation video that you need know nothing whatsoever about to enjoy. Just ask my cats. This crazy gorgeous piece, commissioned by Europeana Creative and funded by the EU, uses recorded bird sounds from the archives of the Netherlands Institute for Sound and Vision. 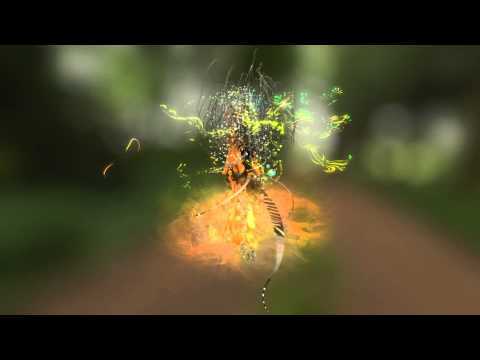 Alongside photographs of various flora and fauna, sketches, and even paintings, the artist uses a variety of 3D visualization software to achieve dramatic and enchanting motion graphics. Packages such as 3ds Max, Fumefx, Krakatoa, RealFlow, emTools, Zbrush, Vray, ChronoSculpt as well as After Effects, Photoshop and many more, combine a collage of images into art forms. The artist then adds the birdsong recordings and “uses the geometry activated with the audio float controller in 3ds Max” to mix sound and motion. This synthesis creates the animation in concert with the music for a visually arresting result.